Simulation models are an established method used to investigate processes and solve practical problems in a wide variety of disciplines. Central to the concept of this second edition is the idea that environmental systems are complex, open systems. The authors present the diversity of approaches to dealing with environmental complexity and then encourage readers to make comparisons between these approaches and between different disciplines. An overview of methods and approaches to modelling. Focuses on simplifying complex environmental systems. Reviews current software, tools and techniques for modelling. Gives practical examples from a wide variety of disciplines, e.g. climatology, ecology, hydrology, geomorphology and engineering. Has an associated website containing colour images, links to WWW resources and chapter support pages, including data sets relating to case studies, exercises and model animations. 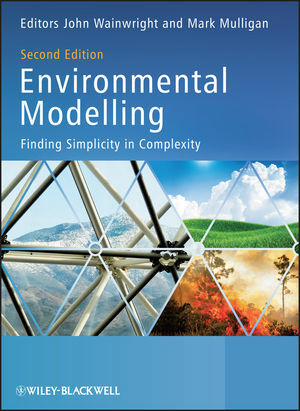 This book is suitable for final year undergraduates and postgraduates in environmental modelling, environmental science, civil engineering and biology who will already be familiar with the subject and are moving on to specialize in the field. It is also designed to appeal to professionals interested in the environmental sciences, including environmental consultants, government employees, civil engineers, geographers, ecologists, meteorologists, and geochemists.